Like many of you, I’ve been playing a lot of Fallout 4. One of my favorite perks is The Mysterious Stranger. You can unlock that perk once you get your Luck up to 4. I highly recommend it as he has saved me in combat numerous times. Of course part of the enjoyment are the audio stingers you hear when you are in combat and he appears. I contacted my friends at Bethesda and they were kind of enough to send them to me to share. Enjoy. Note: These audio clips are provided for personal, non-commercial use only! Tomorrow will see the release of Call of Duty Modern Warfare 3. In addition the Xbox 360 Limited Edition Call of Duty: Modern Warfare 3 Console we announced earlier this year will also go on sale. If you really want to get in the mood, I’ve posted the custom sounds that the console makes. Here are the .WAV files of they what they sound like: power on/off and disk tray eject. Feel free to download them for your personal, non-commercial use. They make great alert tones. I posted this some time ago, but when I moved my blog earlier this year, a few things got lost in the shuffle..namely the post that pointed to this file. So back by popular demand…the sound that has been heard multiple millions of times around the world of as Xbox 360 Gamers run up their Gamerscore: The Achievement Unlocked sound. These audio files were created directly from the master file – so they don’t get any better than this. I know that you’ll use it for a ring tone, but what are some of the other creative ways do you plan to use this? Previously shown content for the title includes the Jedi mode unveiled at E3; complete with Lightsaber combat and Force movement, the mode optimizes the ideal mix of gameplay feel and heroic animation through epic Jedi duels with an array of fan favorites from the Star Wars universe. The Kinect Star Wars’ Podracing game mode allows fans a chance to compete alongside the surviving racers of the Boonta Eve in recognizable pods and other unlockable vehicles native to the Star Wars universe. 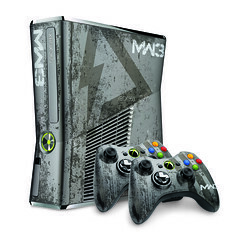 The Xbox 360 limited edition Gears of War 3 Bundle includes an exclusive red and black console design with two custom-designed Xbox 360 wireless controllers, a 320GB hard drive and built-in Wi-Fi connection for easier access to the world of entertainment on Xbox LIVE. The console will be available for $399 (US ERP) and at your favorite retailers beginning September 20, 2011. The package also includes a standard copy of “Gears of War 3,” a wired headset, plus a download token for bonus game content including the Infected Omen Weapon Pack and the Adam Fenix character for use in multiplayer. The Infected Omen Weapon Pack gives fan the infected omen skin for use on the five starting weapons: Lancer, Retro Lancer, Hammerburst, Gransher, and Sawed-Off Shotgun. Also, the power and eject buttons have been customized with unique sounds from the “Gears of War” universe. Also, the customized Limited Edition “Gears of War 3” wireless controller will be available separately for $59.99 (US ERP). Hey look I’ve got pictures of the new stuff! Secret of Monkey Island and Madballs in….Babo Invasion are this weeks Arcade titles. Both will be available this Wednesday. Monkey Island will be 800 points, while Madballs will be 1200 800 points. Garou – Mark of the Wolves and Droplitz will be available this Wednesday for 800 points each.